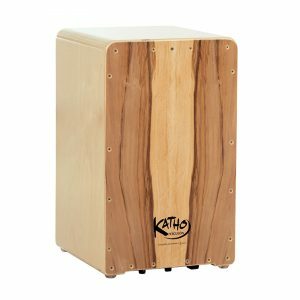 En 2017 creamos un nuevo cajón de alta gama: Moderno, ergonómico, con tapa de madera natural, con 6 cuerdas agustables individualmente, de acabados impecables, … y guapísimo. Por detrás lleva una roseta gravada alrededor del agujero. 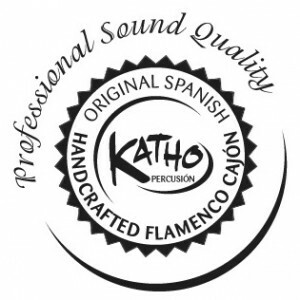 Su aspecto y su sonido: un Señor cajón. 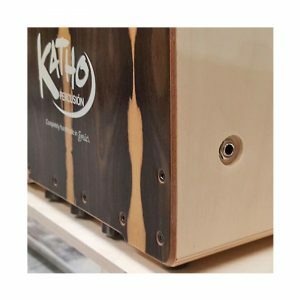 Existen dos versiones para la “Esencia”: Con tapa de colores claros o de colores de madera oscura. Ambos modelos están disponibles con o sin amplificación. 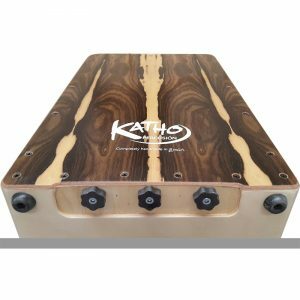 Con el nuevo micróphono de contacto de BoTon, técnología suiza, logramos presentar un modelo perfecto para todo tipo de actuaciones, niveles de percusionistas y ocasiones que puedan surgir. Simplemente insertas el cable en el Jack y listo. Tapa frontal de chapa de madera natural, con tonos oscuros (Ziricote) o de tonos claros (Red Gum). Acabado natural, por lo que cada tapa es única. Tapa trasera de 10 mm y reforzado hasta 18 mm alrededor del agujero interiormente. Lleva una roseta gravada como bello detalle de decoración. 6 cuerdas montadas en forma de “V”. Sistema de afinación mediante 3 palometas que permite un ajuste muy preciso e individual para cada cuerda. Medidas 47 x 29 x 29 cm. 6,5 kg. Seat-pad incluído. 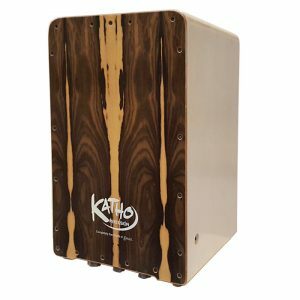 New high range cajon, modern, with natural wood grain front plate wich makes every unit singular, perfect finishings, 6 individually tunables strings, ergonomic shape, best sound varietions, and with contact microphone and pick-up. There are 2 differet front plate colores available, a dark wood grain or a clear wood grain front. 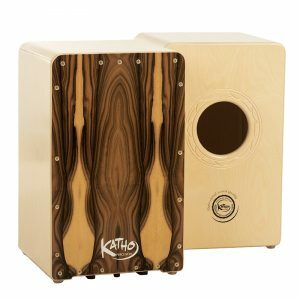 Both models are available with or without amplification. The outstanding cajon quality together with the incorporated contact microphone from Bo-Ton (Swiss technology) bring to the people a new professional box drum for stage, recordings and all other type of performances. You simply take the cable, connect to the jack, and the show starts! 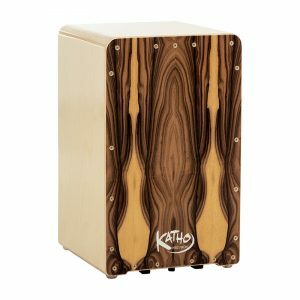 – Birchwood structure of 9 mm, extremely rounded edges and corners on the upper part such like every cajon from the KATHO-Confort-Series. Sound plate from natural wood grain layer with dark colored (Ziricote) or clear colored wood grain (Red gum). 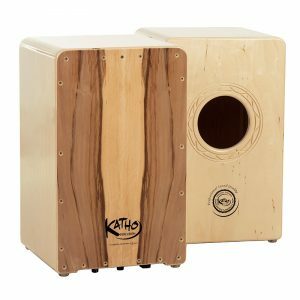 Every cajon is a single piece because the wood grain never is the same. Best surface protection finish by 5 layer varnish. 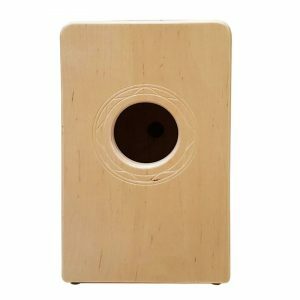 – Backside of 9 mm thickness, sound hole reinforced to 21 mm. Decoration detail is a carved rosette around sound hole. – 6 strings, with new Tuning-System (Hand screws) individually tunable. Easy to handle, even while sitting on the cajon. Precise adjustment of each string. No allen key needed anymore. – Available with or without integrated boton-microphone and Pick-Up. Seat pad included. 47 x 29 x 29 cm. 6,5 kg.